Photos courtesy of HCI Books. In a food processor, process the sunflower seeds and dates into a fine meal. Add the remaining ingredients and process until sticky and blended together. Refrigerate for 10 minutes to harden and then roll into one-inch balls. Makes 15-20 nuggets. Cook the wild rice and spelt berries as per package directions. Once cooked, place both into a large bowl. Stir in the sea salt, onion, scallions, pecans, dried cherries, and grapes. Add the Balsamic Maple Dressing (recipe follows). 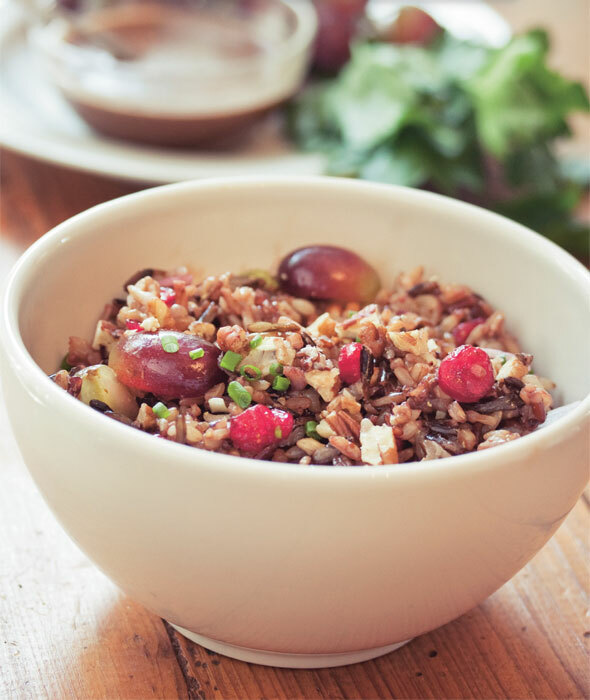 To make this dish gluten-free, replace the spelt berries with regular short-grain brown rice. Serves 4.